Reading is one of the best ways to connect with your son or daughter. At Therapy Spot our team has found reading allows for opportunities for communication, improves listening skills and supports the development of social skills. Early literacy experience can affect a child’s development in reading, writing and language (Hetzroni & Schanin, 2002). Important components of emergent literacy include access to print, opportunities for listening to stories and the quality of reciprocal interactions that occur during reading (Heflin & Alaimo 2007). Some children with ASD may find it quite difficult to sit for long periods of time, or may find a book uninteresting and quickly want to do something else. Check out these top 10 tips and strategies for making reading a fun and desirable activity in your child’s day. 1. Length of time. Begin reading for short periods of time and focus on pointing to and naming objects. Have your child help you turn the page and celebrate after your child has completed the book – however long or short it is. Our speech pathologist suggests using a visual timer to help your child understand the length of time allotted to the book you are reading together. 2. Reading all the words. Don’t feel like you need to read the story as written. Focus on using simple language and exaggerating repetitive phrases. Make up a story using the pictures and objects you are pointing to. 3. Repeat books. The repetition will help your child learn the language and will foster opportunities for communication. Once your child knows what to expect, have them touch, point or show you whats going to happen. Books with rhythms, rhymes and repetitive phrases both promote opportunities for communication and allow the child to become familiar with the patterns within the book. 4. One-up rule. Build on your child’s expressive language. If you child labels the ‘tree’, one-up their communication by describing the tree – “big tree” or “green tree”. 5. Reading position. Come down to your child’s level. Try to read across or in front of your child to promote opportunities for communication as well as fostering eye contact and engagement. Bean bags, couch cushions and spin chairs are all recommended. 6. Interest. 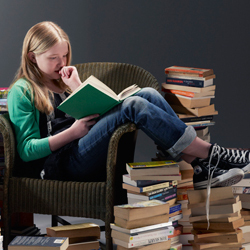 Pick books that are highly desirable to your child. Trains, animal books and Dr. Seuss books are all clinic favourites. 7. Interactive books. Try to pick book which have music buttons, lift up the flap, reflective and different texture options. The change in style of book will both excite your child, and allow them to explore their sensory preferences. 8. Social Stories. Social stories are a powerful tool when supporting your child with daily activities. Not only do they foster your child’s social skills and understanding, but they are often written from the child’s perspective, providing the language and ability to deal with the situations in real life. 9. Questioning. Have your child answer simple questions to target their receptive skills. Ask your child to ‘touch the dog’ or ‘point to the flower’. If your child is not responding, gently touch the picture together while verbalizing ‘dog’.Remember to always use the helping hand strategy; for every 4 comments you make, ask the child one question to avoid the child feeling like they are being tested throughout the book. Remember to always give positive praise, even if you completed the question together! 10. Havingfun. Please do not think that sitting down and reading a book is the only way to encourage your child to read. Street signs, words on the TV and advertisements are all different forms of written communication. Try a variety of reading materials – picture books, comic books, newspapers, cartoons, magazines, and websites are all great alternatives. Heflin, J.L., & Alaimo, D. F. (2007). Students with autism spectrum disorders: Effective instructional practices. Upper Saddle River, NJ: Pearson/Merrill Prentice Hall. Hetzroni, O. E., & Schanin, M. (2002). Emergent literacy in children with severe disabilities using multimedia interactive stories. Journal of Developmental and Physical Disabilities, 14, 173-190.